I’m leaving for Norway in less than two weeks, and am counting the days. For so long it seemed the trip was so far off, but not now! I’ve never found the right words to describe the beauty of western Norway, and my art making may never do it justice. Nevertheless, I’ll take another stab at it while I’m over there – and when I’m not fly fishing! I have a terrible case of trout on the brain now, which is actually the perfect mindset. Since I last wrote, I’ve been working on columns and an article for Fly Tyer Magazine. 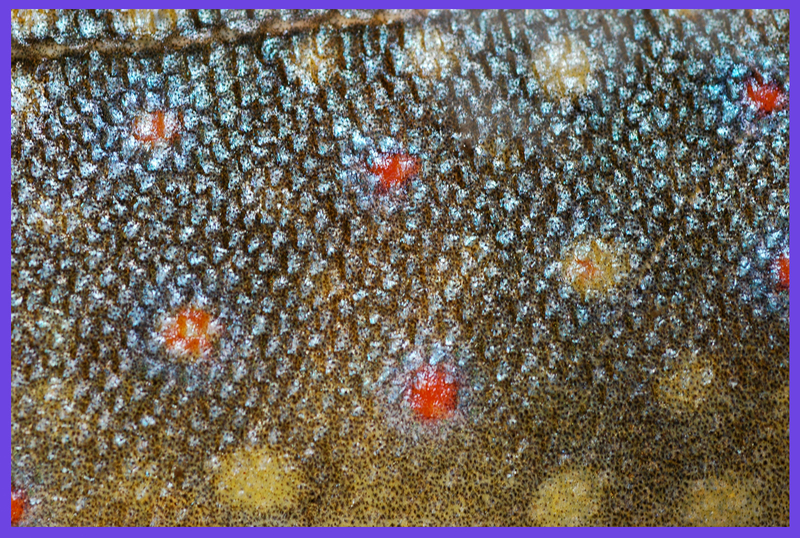 Below is the side of the most beautiful Brook Trout I’ve ever seen (his head shot will accompany my new article). I caught and released this little fellow some years ago on The Big Blue, which is the paradoxical name of a minuscule creek high up in the mountains of southern Colorado. Have you ever seen anything so gloriously colored up and textured? The closer you looked, the more entrancing the view became! It is really worth seeing enlarged views of these two photos – click READ FULL ARTICLE in the gray bar just below. I’ve uploaded hi-rez images of 4 more finished scenes from Paterson, NJ – and lots of details too! While you may have seen these pictures in my blog (and perhaps followed their creation there), these new views are vastly improved. 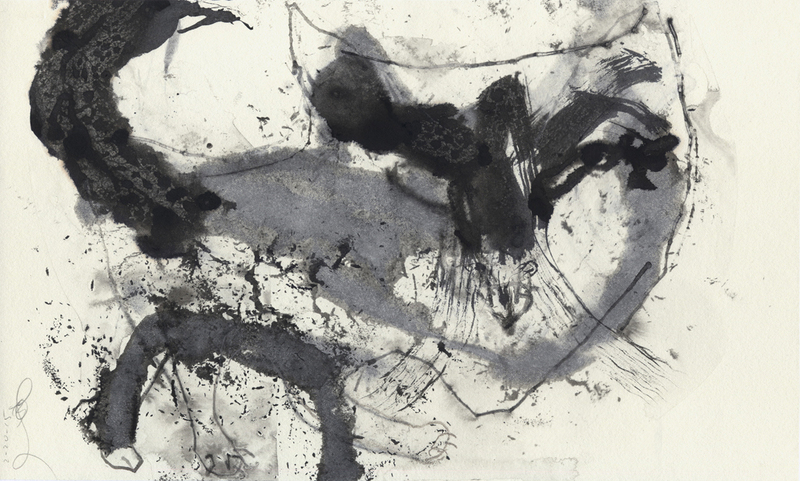 You’ll get a true sense of the delicate mix of tones I’m now achieving, and how interwoven my mark making and altered surface has become. I sometimes think I’m sculpting as much as I’m drawing. Are you’re wondering about the S.U.M. in the picture’s title? It stands for the Society for Establishing Useful Manufactures. 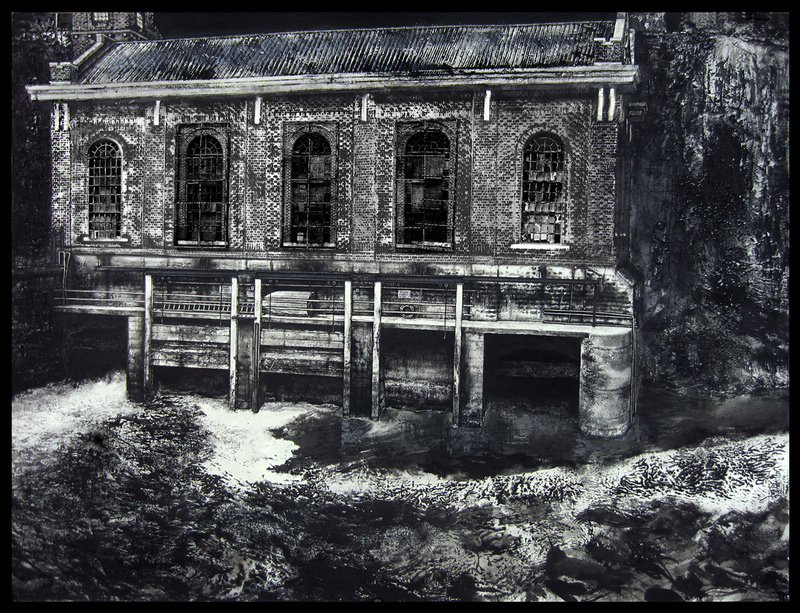 Envisioned and championed by Alexander Hamilton, The society was founded in 1791 as a private, state-sponsered corporation meant to establish industry along the Passaic River, especially at the Great Falls, which offered a fantastic opportunity for hydro-power. The power plant (also water powered) began generating electicity in 1914, and continued to do so until 1969, when the low cost of fossil fuels and high cost of replacing aging equipment forced closure. The oil crisis of the 1970’s changed that equation. 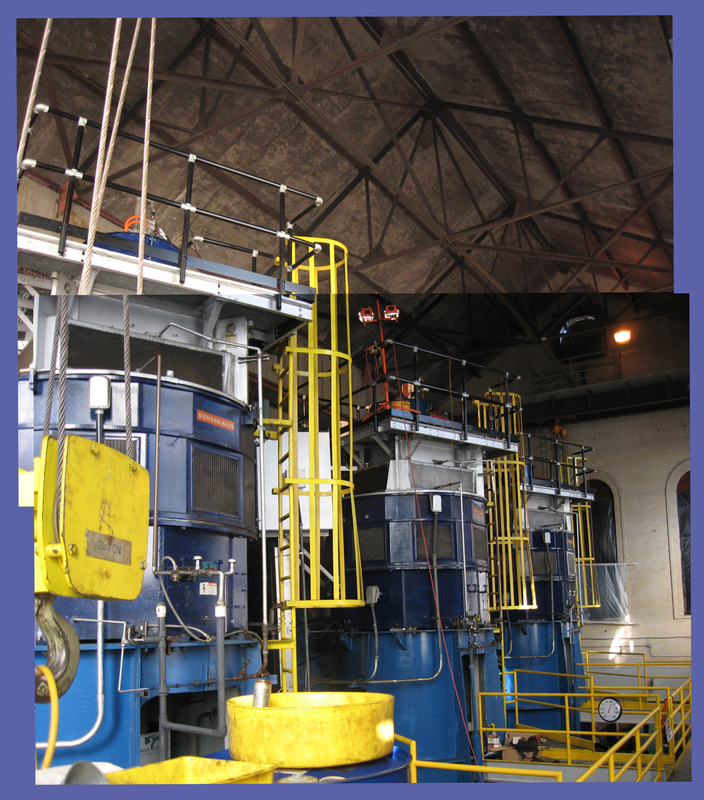 Three new turbines were installed and the plant was rededicated in 1987. It’s still in operation. The best part though, is that one of the old turbines was left in place. As you look at my drawing, it’s behind and below the window on the right. I’ve become quite fond of this grand old building. PS: just for fun, here is the old turbine. 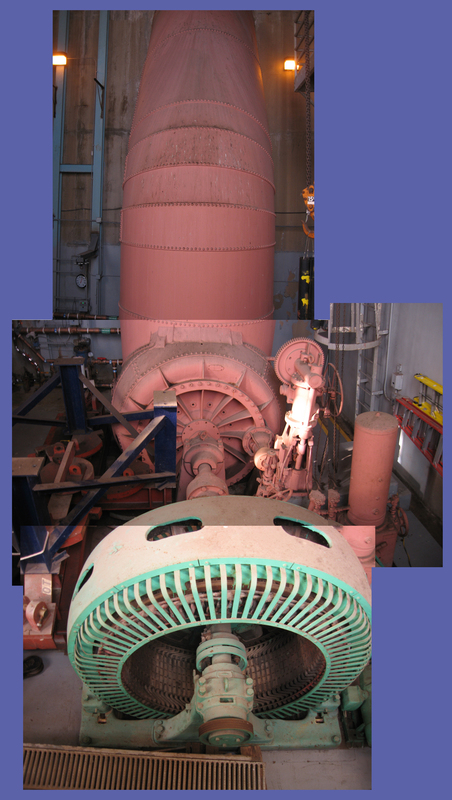 The thing that looks so much like a giant pink stovepipe is where the water came down, hitting the turbine’s blades and forcing it to spin around a horizontal axis (just like the wheels on your car do). This in turn spun the generator (in the green housing). While the setup is no longer functional, I’m so glad it remains as a piece of history. The photo below is of the three more modern turbines, which spin in a vertical axis. Usually only one or two of them are in operation – the river has to be quite high before there is enough water to power all three. Here is a screenshot of my desktop with ALL of my Paterson pictures as thumnbnails. 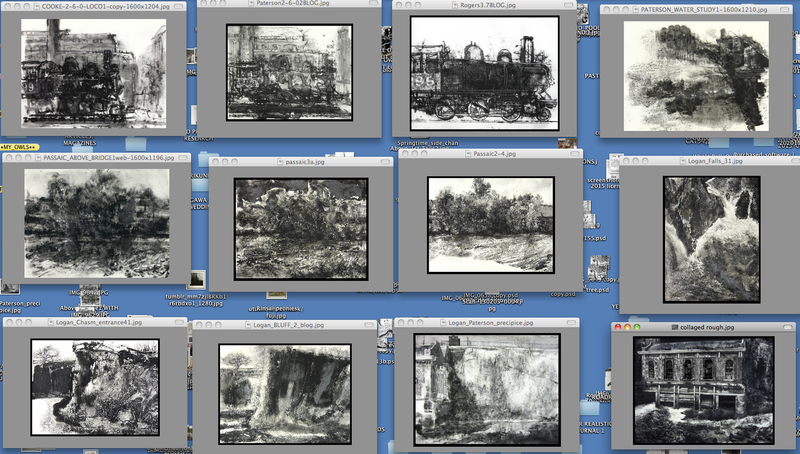 One of the river pix (2nd from the right – middle row) isn’t done yet. 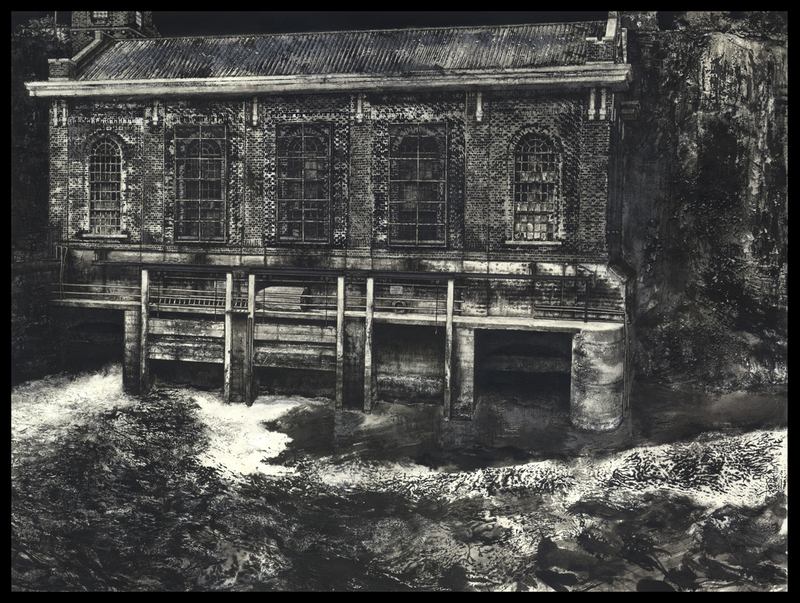 I also did a sneaky bit, making a digital rough of my latest power plant picture (lower right): I pasted in hugely darkened, photoshoped windows snaked out of a photograph of the building, just to see how such a thing might look. The windows I actually paint will have to be at least this potent for my power plant to really pack its punch. This is the first time I’ve seen all of these together at once, and the first hint of what my contribution to Bob’s and my exhibition will look like. Overall, pretty nice, but also waaaaay darker than I realized! I wonder if I should try to do a couple of light, sketchy pictures just to change the mix a bit? PS: I thought you might like to see a larger view of my digital rough with the pasted in windows. Remember, these aren’t the real deal! I still have to actually do ’em. PS: to expand these images (and to better see my lineup of thumbnail images), click READ FULL ARTICLE, immediately below. And here I am again! 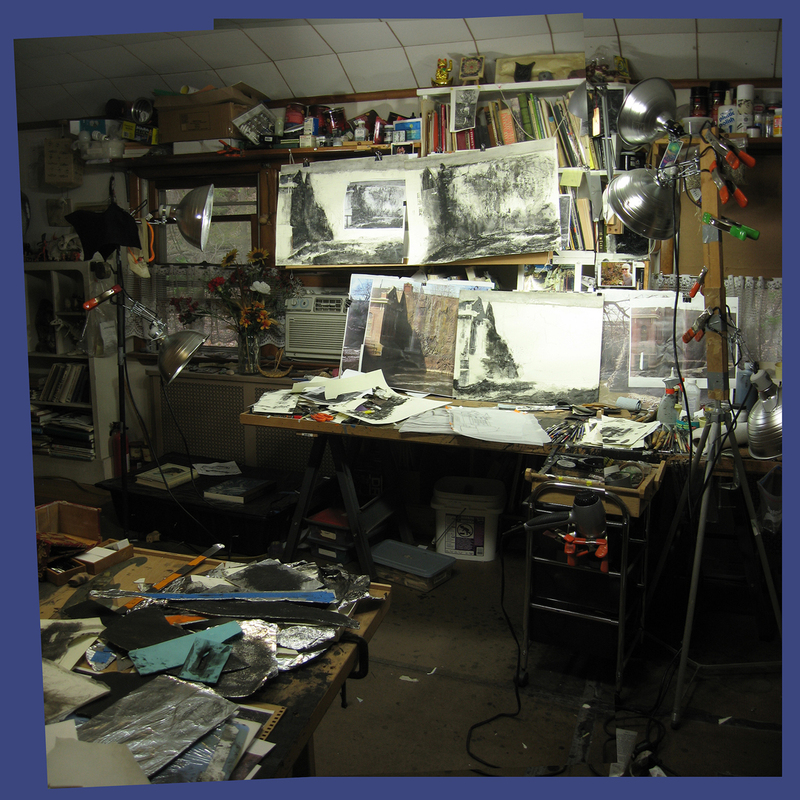 I’ve just now received an email and new image from my partner in art, Bob Demarest! 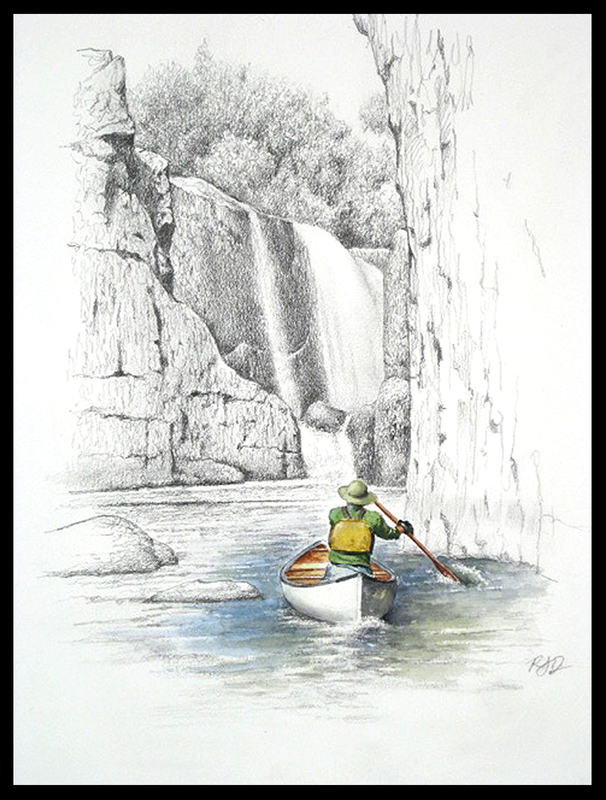 Last autumn, a canoeing enthusiast and friend of his took him around the bend and deep into the chasm of the Great Falls in Paterson, NJ. Bob said it was like entering a cathedral. The result has been several truly wonderful paintings. One has eluded him however, despite several attempts. It’s a seemingly simple picture of his buddy paddling up into the very throat on his own to see if it was safe before taking Bob. It was. They did it, and Bob has wanted a painting commemorating that moment ever since. He has at last conquered the image, by leaving most of it a tasty pencil rendering. There is color only where it counts most. PS: For a better look, click READ FULL ARTICLE in the grey bar below! To the Left of the Great Falls – A Spring Morning in Paterson, NJ. Double your time, then double it again: this old axiom usually proves true when I estimate how long a painting will take. This latest one was no exception, but at long last it’s DONE! I like it a lot! 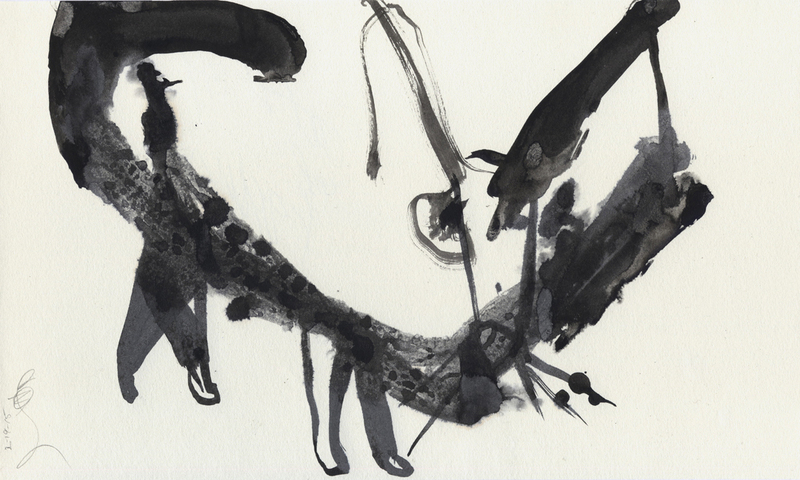 My mother (who was a painter), would sometimes speak of her change of brain when discussing her work and method. What an apt description this is of what must happen as an artist’s approach evolves. It’s normal now for me to brutally scar, scrap and even rip up the top layer of my paper. 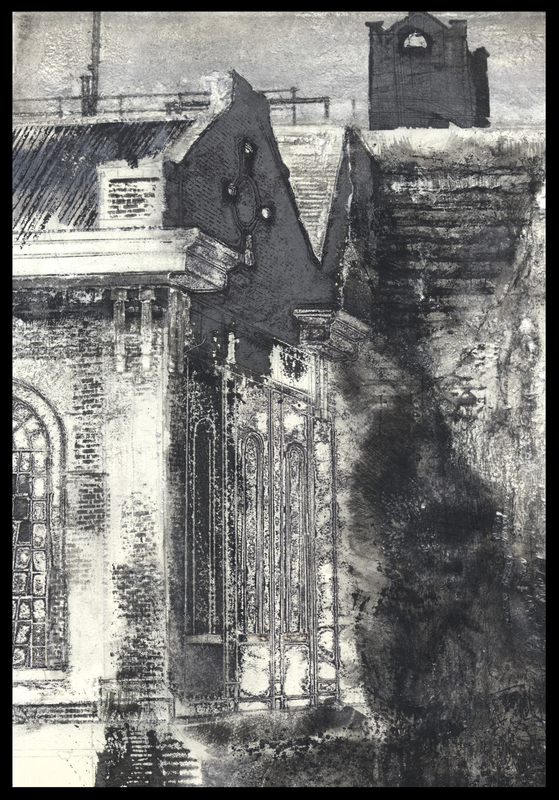 It gets even worse when I attack in the wet, yet I’m astonished by the degree to which I can alter the character (or even the tone and temperature) of my paper, surface and simple India ink. 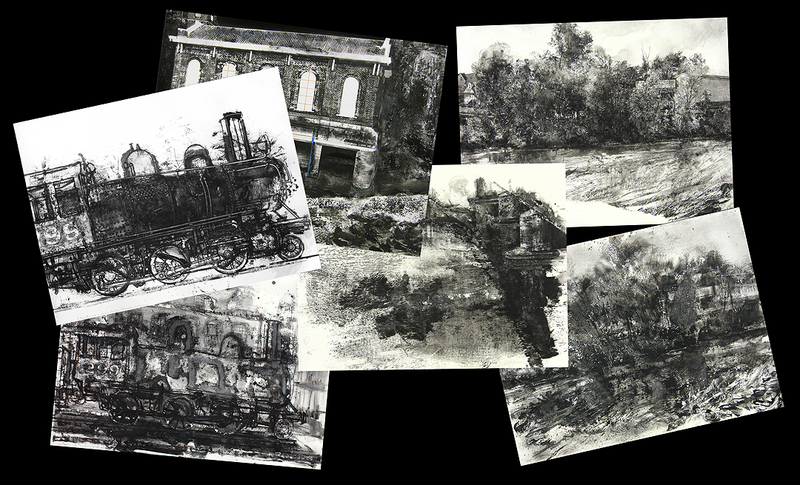 Much of my technique has descended from how I not so long ago desperately tried to save and yet wrecked drawings. 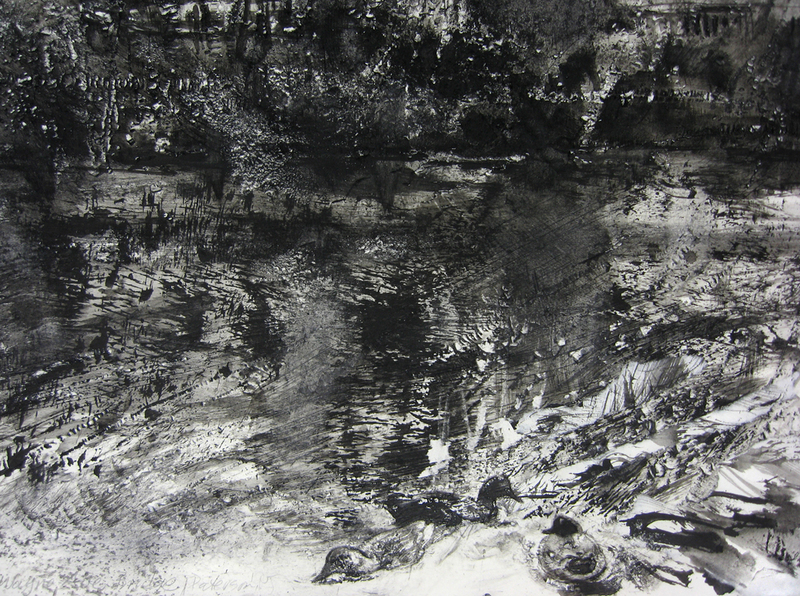 Horridly fatigued paper and ground in, over scrubbed mark making suddenly look good. Of course, all of this means no picture is really done until I’ve spent an hour or two patching and reinforcing it from the back. Can you spot the actual holes in this new one? Hint: the largest is the size of a pencil eraser – look for the brown spot (actually my backing board peeking through) in the shadowed area to the right of the power plant. 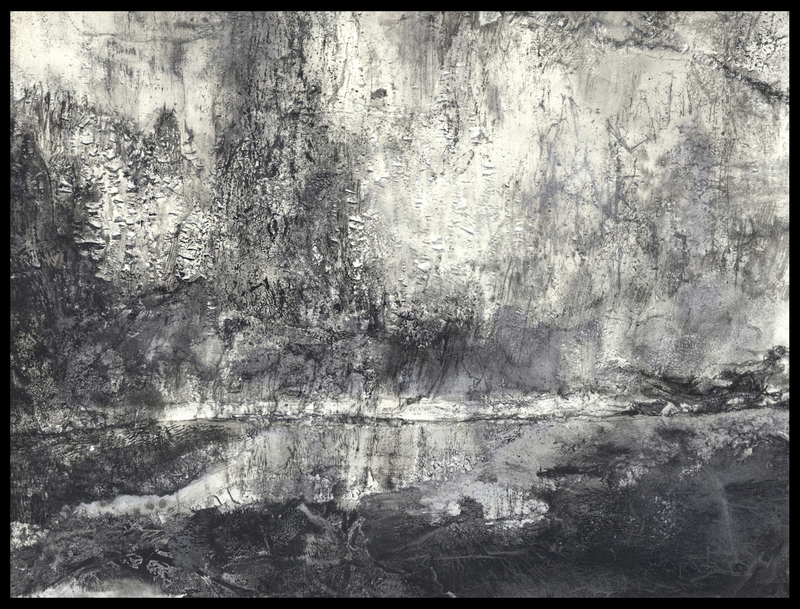 PS: To give you a real sense of the texture and character of this painting, here is a close up scan of the rock wall and water at the lower right. 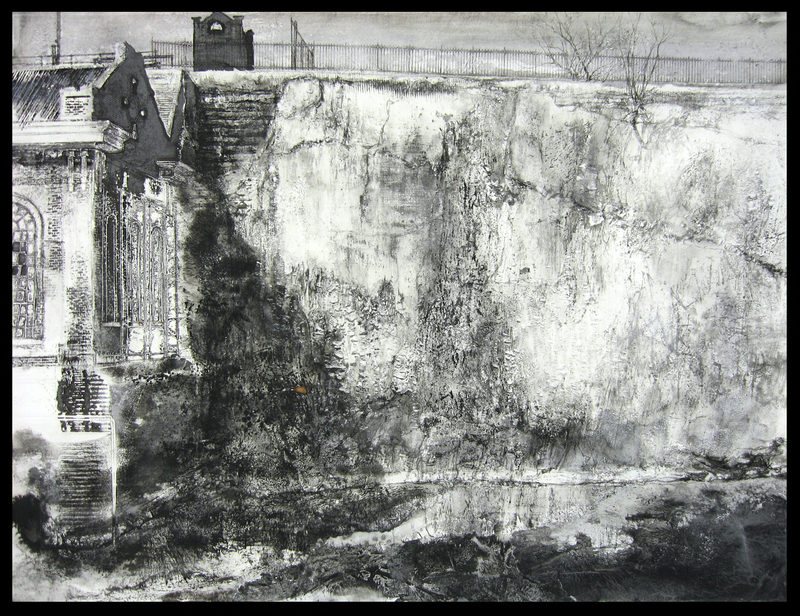 And this is a view of the upper left, scanned before I added the fence and other final details. PS: to expand these images and see more detail, click READ FULL ARTICLE, immediately below. 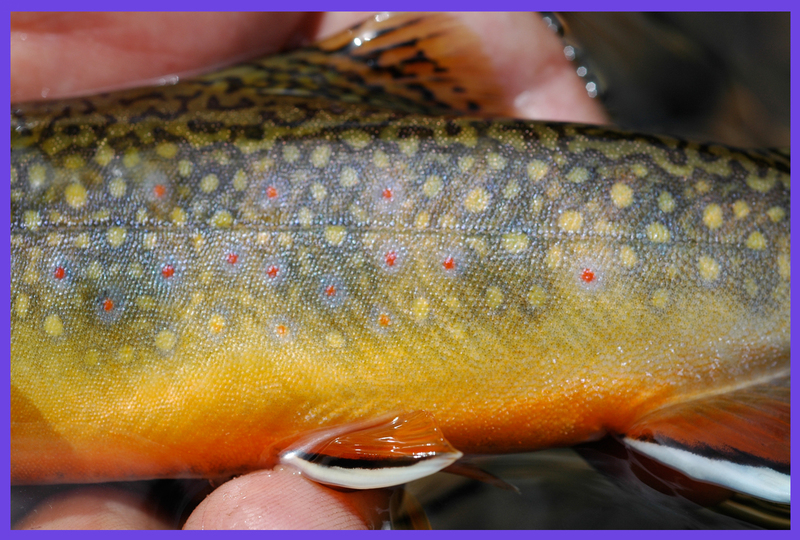 I have a new article out on fly tying tricks (as in better ways to make better flies to hoodwink innocent trout)! 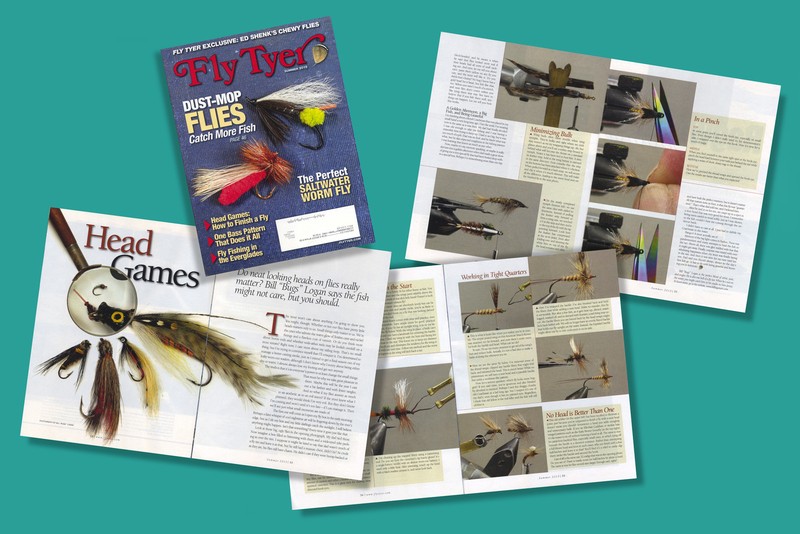 Fly Tyer Magazine is the only one of its kind, so it has claimed a niche. That said, I think it’s the best fly fishing related publication going. Beautifully produced, it’s always informative and strictly no nonsense. The Editor, Dave Klausmeyer, is a straight forward guy – enthusiastic and unashamedly opinionated. In short, he’s a gas to work for (and chat with). Over the years, I’ve written, photographed (and even occasionally illustrated) many articles for this magazine, and am happy that I’ve recently begun doing a few columns for them as well. Okay, enough about bug making – now I gotta get back to ink slinging. Hopefully I’ll post about that tomorrow night! Almost the first thing I saw when I got back home from my trip late Tuesday night was my beautiful bride’s newly painted toes! Well okay, it wasn’t really the very first thing I saw. Reidun heard me backing in our upper driveway and dashed out of the house. She’d been waiting up for me, reading in bed, and there in my rear view mirror she stood, um, shall we say, spectacularly au naturel? I’m a lucky boy. Reidun’s pal, Grace, painted her toes. 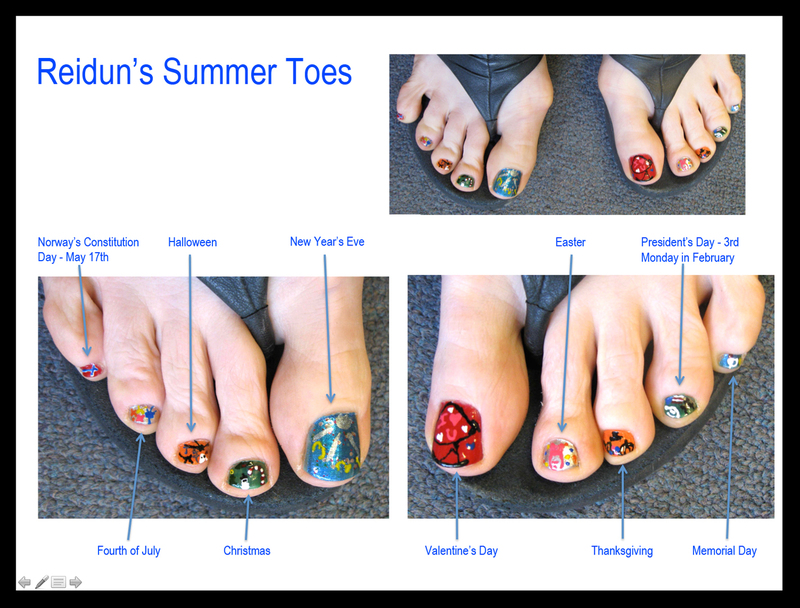 She is just home from a triumphant first year of college, but she and Reidun having been painting toes since Grace was a peewee. They have quite the kit now and Grace is a wonder. She is the happiest, goofiest, quickest witted, most perfect Grace there is, and sooooo lives up to her name. 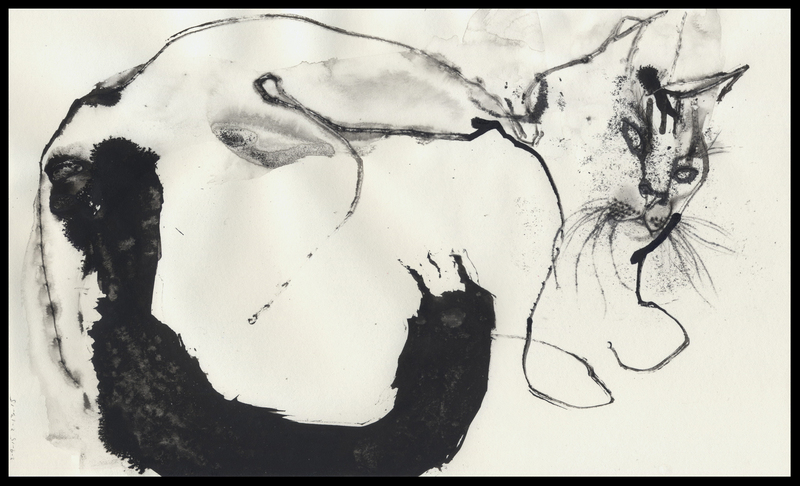 In a few minutes I’m going to open my ink pots and get to it again! Am hoping I’ll make good moves and quickly. I’ll keep posting as I progress, so check back in once or twice a week! PS: For a better view of Reidun’s wonder toes, click READ FULL ARTICLE in the grey bar below! Just a quick note and photo from the studio. I’m slinging ink and messing with some really odd new tricks – pushing hard before I leave on Sunday for southern Illinois. With luck (and hopefully a little bit of sleep tonight), the picture propped up at lower left may be a good bit further along by tomorrow evening. I’ll post another photo if it is. Then I hafta frantically pack the car, forget something I need (because I always do) and head for the land of everything but trout to catch what I can. I’ll enjoy friends I miss, drink fabulous home brew, attend a high school graduation and give a budding scientist a big hug (and a safety lecture) before she heads off to Barrow, Alaska on a six week research trip. Oh, and as I’ve been working since just after 5:00 this morning, I think I’m allowed climb into the hammock with my Sweetie when she gets home. I’ve earned such delight, yes? All of the sudden it looks like summer out there! 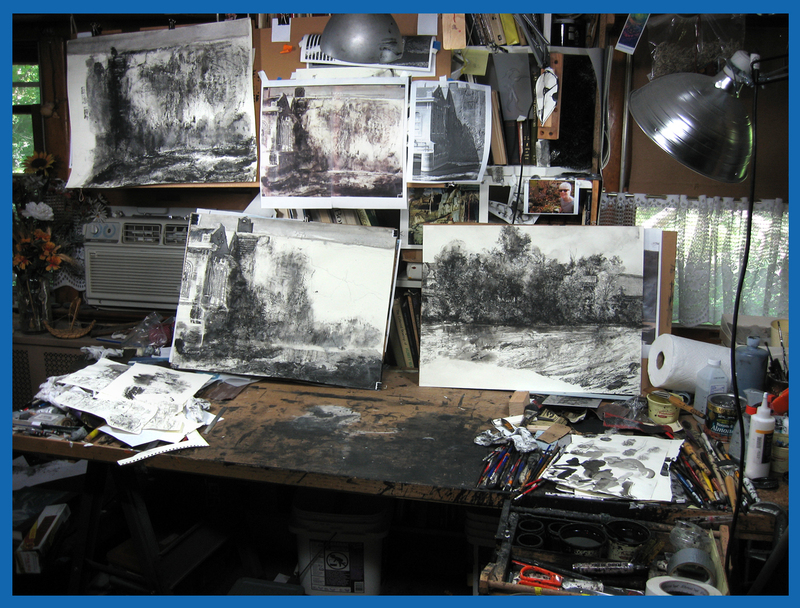 Ps: For a better look at my latest drawings (and my messy work table), click READ FULL ARTICLE in the grey bar below! 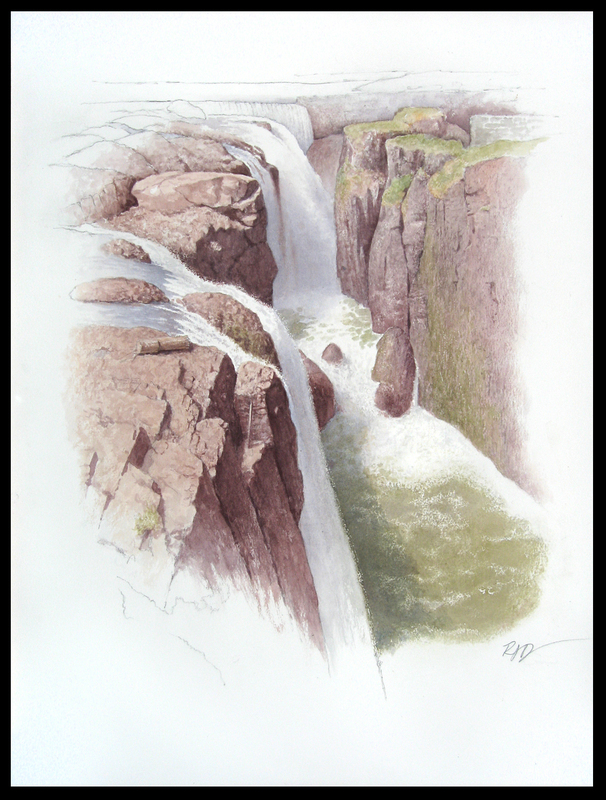 Our friend, Bob, has just finished a wonderful view of the Great Falls in Paterson, NJ! I’m trying to find the adjective that feels just right for describing this painting, and I think it might be delicious. This is a perfectly edited image. If you’ve ever tried to leave out as much as you’ve left in a picture, or a paragraph or some other creative effort, you know how difficult it is! Bob has given us plenty to hold our attention. My gaze tumbles right into that gorge! Can you see why I’m lucky to have him as my painting buddy, and why I work so hard to keep up with this guy? Our exhibition this autumn is going to look even better than I’ve imagined. I’m excited. A few weeks ago, a fellow who had seen me hard at it for days, trying to make a couple of good pictures of the mouth of the Great Falls chasm (in Paterson, NJ), finally stopped to ask why I wasn’t doing the actual falls. He very helpfully pointed out that if I shifted just a little to the left, I would see them. I’m sure he thought I was a nuts when I tried to explain that I was painting the views no one else pays attention to. One picture is proving an unexpected challenge. It’s an odd view, almost wholly taken up by a sheer rock face – the escarpment over which the falls tumble. Yes, if I just turned to the right we would see them, but I don’t wanna. If I simply turned more left, I could get all of the wonderful old power plant in view. Not gonna do that either. A little of it is in the picture, but other than that, this is all about rock and water – – – – and I can’t seem to get it done. I’ve crashed the last three attempts and finally (hopefully) might have a fourth try that could go somewhere. I’m beginning to realize this picture should be defined by texture rather than tone, but the graphic logic is getting screwy. For instance, how can it make sense that some big areas of shadow should maybe stay light, while I put darks (or textures) where they don’t belong? I’m perplexed. I’d like to sort this out soon. Until I have a new picture to show you, I’m sticking with it. The photo shows you the mess I make when I have almost no clue what I’m doing! You had better stand back! Here’s something a little different! I took a break from working on my Paterson pictures this morning to finish a little illustration for an upcoming column I’ve just written for Fly Tyer Magazine (http://flytyer.com/). 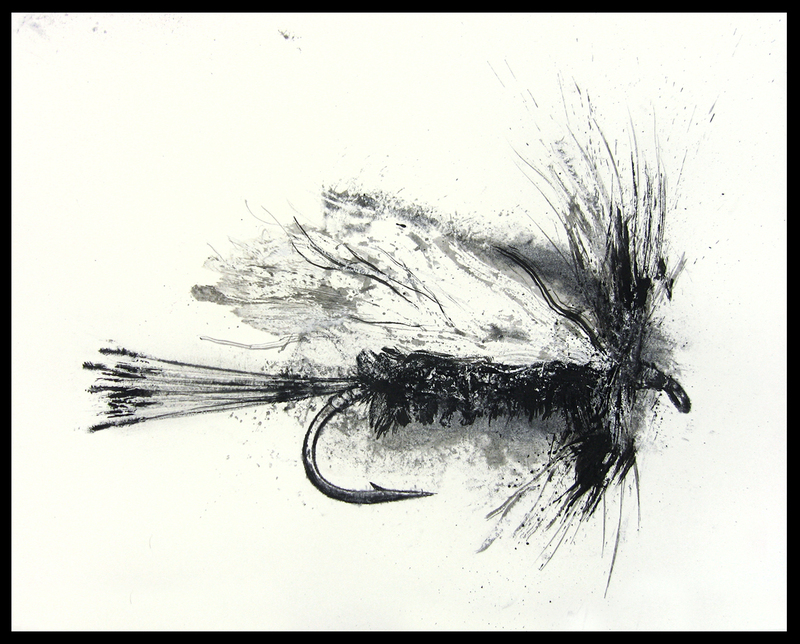 This is a portrait of a forgotten fishing fly, which in my youth was called O’Connor’s Rio Grande King. The man it was named after (also forgotten) was one of my first heroes, and I thought it was time to remind fly fishing friends of some things he knew that we ought to. I’ll give you a heads up as soon as I know when this column will appear. In the meantime, I hope you’re getting set for whatever spring activity spring is finally allowing you to get back to! PS: to expand this image and see more detail, click READ FULL ARTICLE, immediately below. I’ve added 14 new cat pictures to the 3rd page of DRAWINGS/RECENT ADDITIONS (I put them there to keep other work up front on the first page). 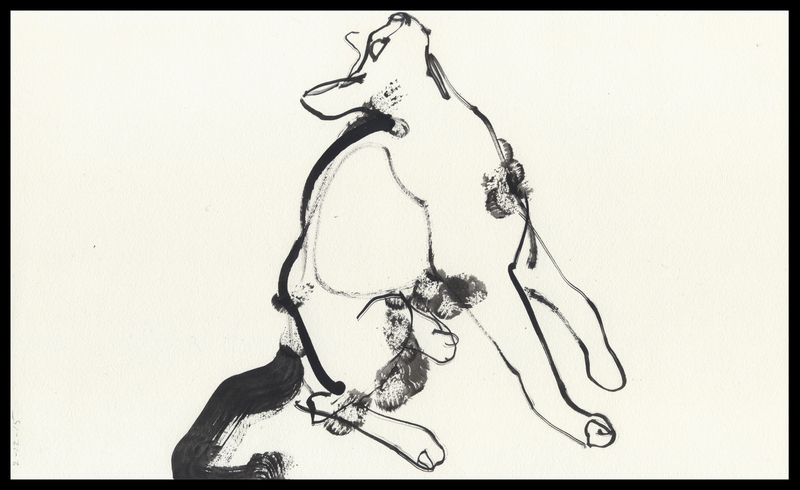 If you go to this link (http://billloganart.com/drawings/recent-additions/page/3/), and start with the cat indicated below, you’ll see mark making I like. Cats #150, 152, 155, 161 and 162 are particular favorites. On this dreary Wednesday morning, I have GREAT NEWS! Director Giacomo DeStefano – of the Paterson Museum – has just extended my buddy Bob and me a huge compliment; we now have an exhibition of our work portraying Paterson, NJ planned for November through December of this year – the whole holiday season. Can you believe it? I feel deeply grateful, and am thrilled. Also, it could be that the weather is about to turn. If we do indeed have sun and temperatures hitting the 40’s next week, I just might begin painting outdoors again, in Paterson, with a new sense of deadline and half of a very beautiful exhibition space to fill. This is gonna be one fine spring! 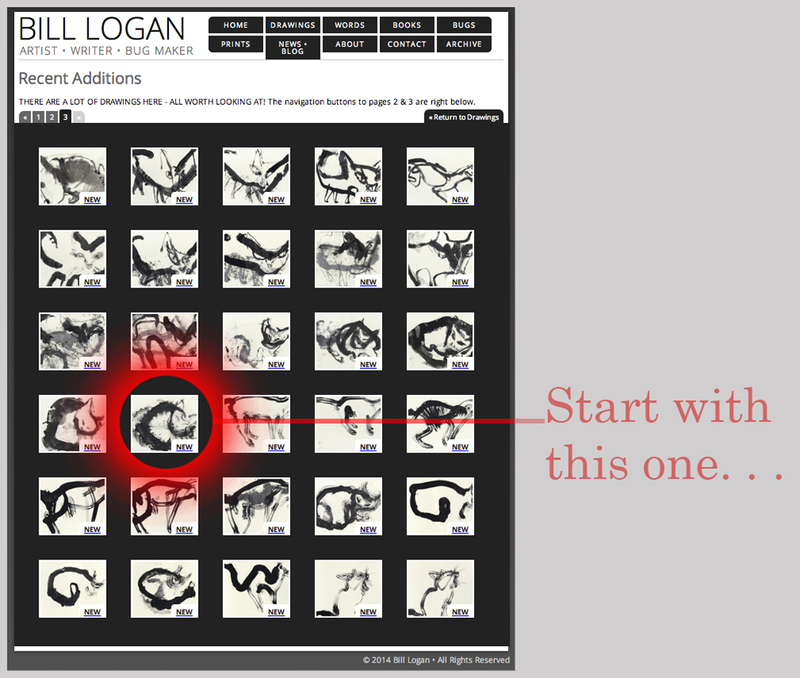 VIEWING TIP: you’ll see that I often go through a number of variations each time I chase a particular image. Maybe I’m reaching for just the right gesture, or I’m not sure how a drawing should be until I’ve tried it a few different times and ways. Sometimes, I have the urge to make a strong mark or move, which then must have a drawing (or several of them) built around it. 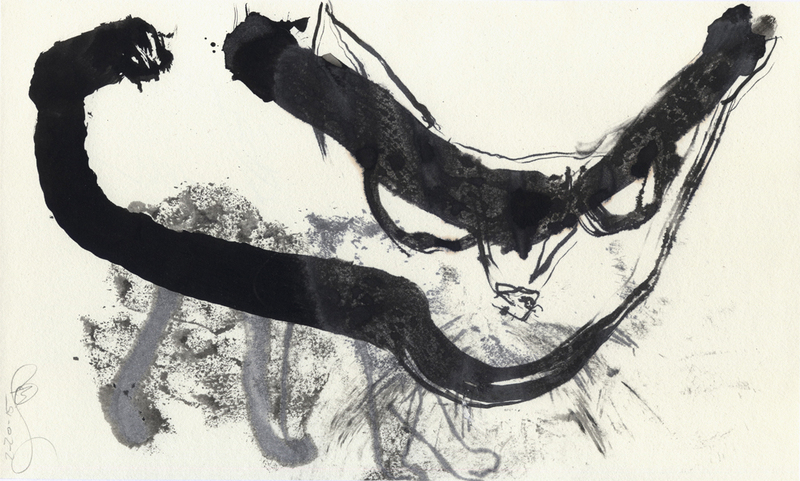 It’s particularly fun to follow a mark as it migrates and changes from one drawing to the next! 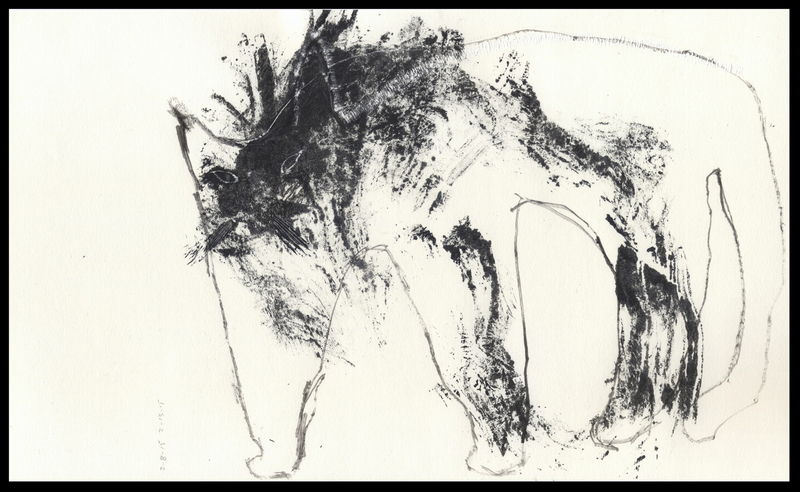 Here’s an example of what I mean: in this sketchy cat, two really bold marks govern the whole image. The first is the broad swipe that starts at the tip of the tail and flows all the way forward under the belly and up past the cheek. 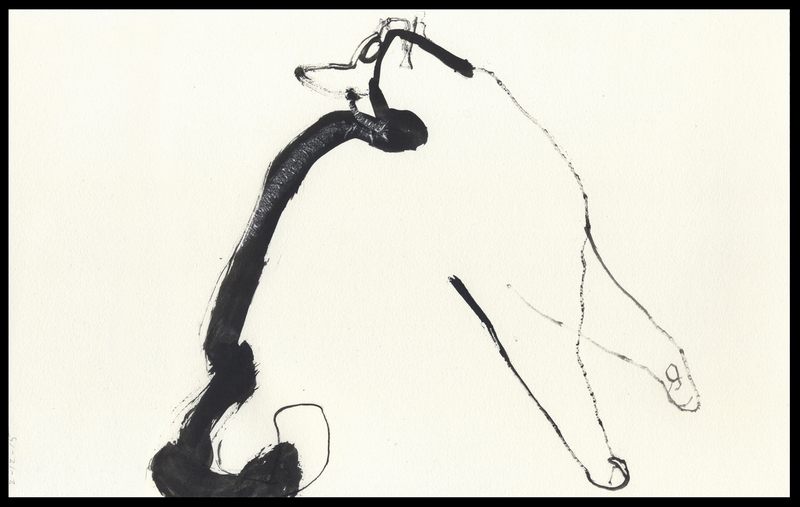 The second mark – just as potent – finishes off one ear. If we took these two out, there would hardly be anything left! 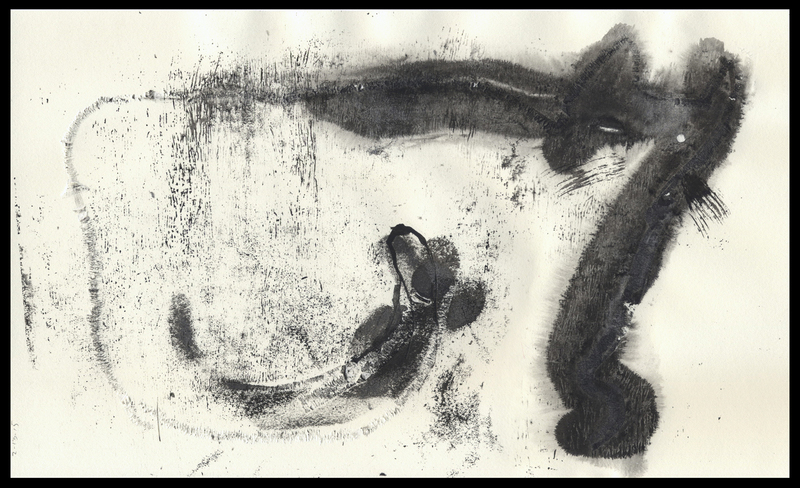 Oh, and I have one more curious tidbit: before making the two big marks, I flooded my paper with rubbing alcohol, which acts as an odd sort of half resist, half diluent to my ink, causing it to both bead up and at the same time really, really penetrate into the sheet. I don’t get why this happens, and I’m just as puzzled that solid black ink, when it sinks so deeply into my paper, turns a decidedly cool shade of gray. I like that it does, but it’s so weird! Now, let’s go to the next drawing. 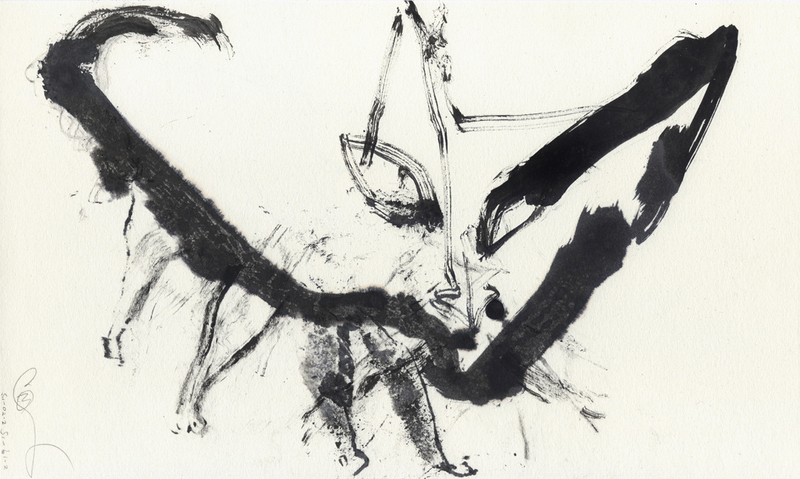 While it’s much the same in form and gesture, more time has been spent working out the accompanying moves – I’ve greatly increased the visual texture in this drawing by adding a variety of different marks that act in contrast to the two big ones. 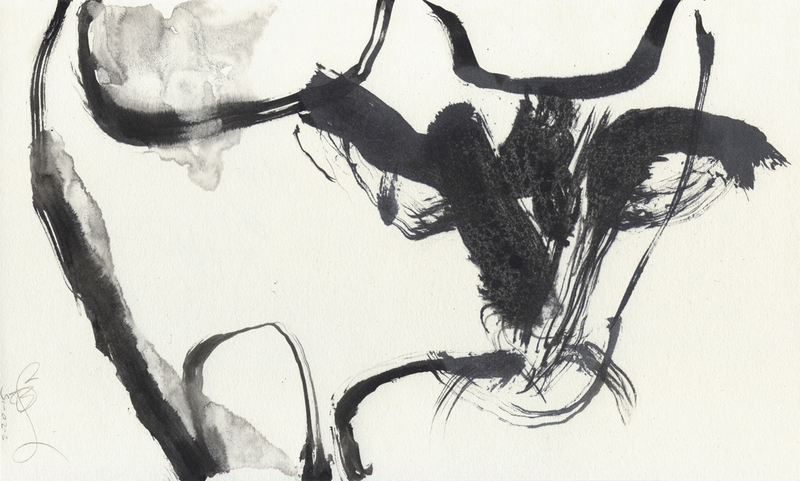 Some were made with a very ragged, split-tipped brush that was dragged along when it was almost dry. Other marks are even more scrubby-looking (consider the legs for instance). 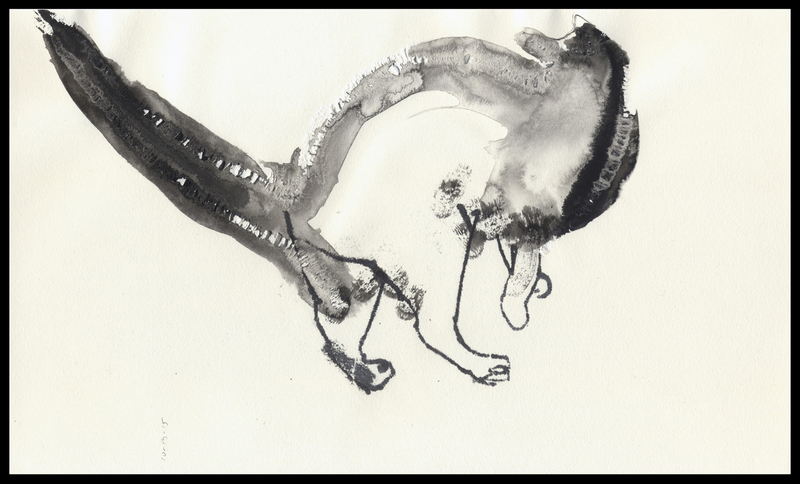 These were done via transfer drawing: I saturated a small piece of paper with ink, laid it wet side down on top of my drawing, and drew/scrapped the legs with my fingernail on the back of it. 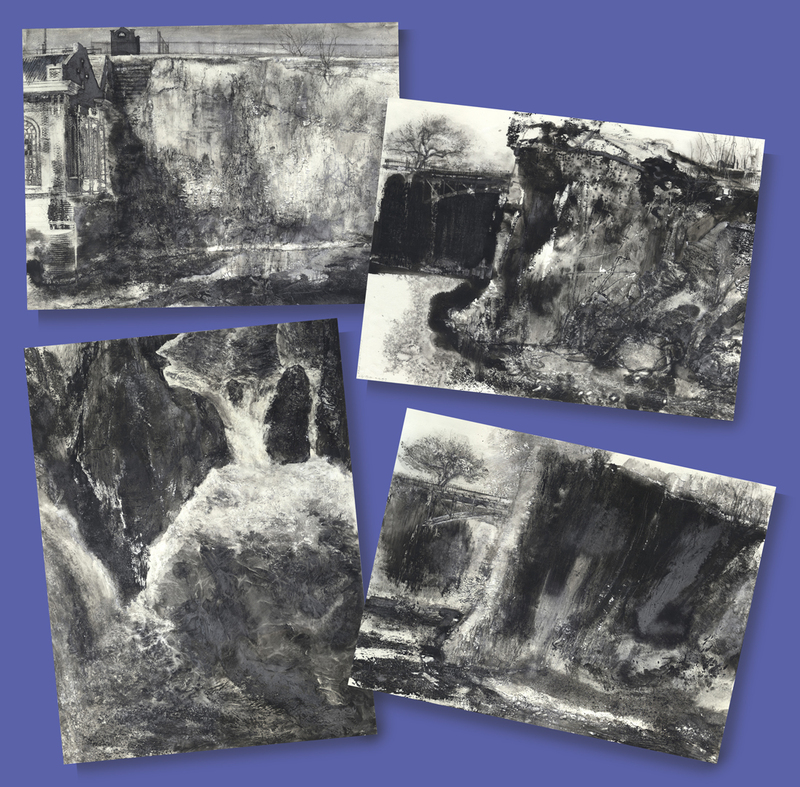 The pressure recorded my gestures in ink pressed onto the drawing’s surface – and even into it, yet again creating marvelous, cool gray tones! And this is where things stand several drawings later: our kitty is a little more simplified again, is grainier still and has gained a good deal of graphic punch. That top mark now carries clear across the head, is a very aggressive move, and sets up both the ears and an angry brow. The legs are again achieved via transfer drawing, this time done with both a finger tip (the fat gray lines) and the tip of a brush handle. The belly swipe disappears in the very next drawing, but the big, black brows are still there. This cat is either related to Groucho Marx, or he’s a bandito pissed off because he’s lost his six shooter and sombrero. And finally, while this kitty keeps his brow and bad cat attitude, the rest of him has deconstructed into a gritty, suggestive funk. I don’t ever want to meet this dude! This kitty is a lot like those I showed you a few days ago – but only got it’s face yesterday. Before I start today’s ink slinging, I thought I might try your patience by sharing one more round of cats. I’ve had such an enjoyable time with them, but today is my last at it. Not only have I succeeded in making some pretty good pictures, but I’ve also elevated my mood (and with any luck, my creative perceptiveness) considerably. I’m ready to face tough drawings again. I really tried to pare down my mark making so that each move counts. It took time and many lesser attempts before I managed to get the second cat just right. Simple looking isn’t simple!